It’s getting to be that time of year again. Once that thermometer starts reaching summertime temperatures in the spring, you can count on shop owners looking for a way to cool down their employees. There’s a good reason for this. A comfortable employee is a more productive employee. When it gets hot this summer, give your employees some relief. Get a shop cooling fan. Not just any shop cooling fan. Get an Evaporative Cooling Fan. What’s the difference? Evaporative Cooling Fans don’t just move the air around. They actually lower the temperature of the air. How? By having the air blow across a pad that wicks up cool water, the air actually cools down as it passes over it. It’s a process that is a proven science. It works! The air coming out of the fans can be up to 28 degrees cooler, depending on various conditions like humidity. And it does so at asignificantly lower cost than air conditioning. When your technician is working under the Auto Lift, you want him comfortable and productive. Take our advice. Don’t wait until it’s so hot that you need to get one. By then, you’ll be too late. Now is the perfect time. That’s why we’ve got them on sale at the lowest prices of the season. Give us a call today. Hot, sweaty days are murder in an auto shop. In the past, you had to throw a couple of portable fans up and just bear it. Or, if you were extremely lucky, you could have air conditioning put in , but at a prohibitive cost. There’s just been no cost effective way to beat the heat – until now. 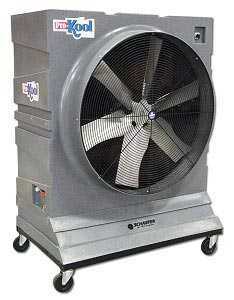 Evaporative cooling fans have been around for several years now. You’ve seen them on the sidelines at soprting events. They truly do cool the area directly within the cone of the flow of air. But how does it do this? basically, when water evaporates, the heat is drawn out of the air and into the moisture. So, you’re not just getting a strong flow of air that a typical fan provides, the air leaving an evaporative fan can actually be significantly cooler than the surrounding air. Up to 20 degrees cooler! The more humid the air is, the less effective evaporative cooling fans are, but in most cases, you will notice a significant difference. There are many different manufacturers of this type of product, and several different styles as well, but they all operate off the same premise. Some units look like a square box with a spout coming out of the top that oscilates, and others look like a huge floor fan. Both have a water reservoir that can be manually filled or you can hook up a water hose to it. These fans have become extremely popular over the past several years and are sure to continue to grow at a rapid pace. The next time you’ve got a car up on the Automotive Lift, and the heat’s unbearable, look at our Evaporative cooling fans.